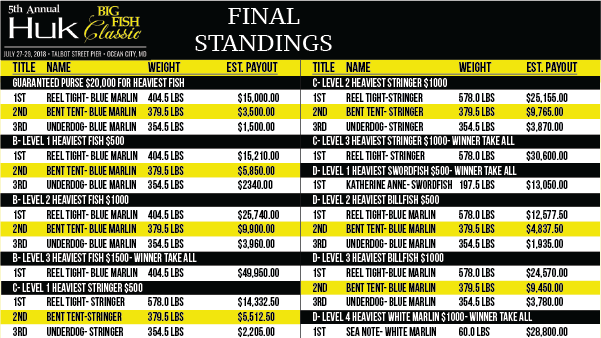 Last week’s madness certainly kept the fleet busy, seeking the prestigious White Marlin worth a couple million dollars. While much of the fleet is still taking it easy, a few decided to fish today to see what the week will bring. The ‘Rhonda’s Osprey’ released two white marlin in the Washington. In the Baltimore was the ‘No Quarter’, who caught 8 Dolphin and released a Blue Marlin. The ‘Marli’ decided to visit the Poormans, releasing 2 Whites and bringing 1 dolphin back to the docks. Also in the Poormans was the Buckshot, releasing 3 Whites and bringing 8 Dolphin back to the docks. The 45th annual White Marlin Open is a wrap and we would like to say Congrats to all the winners and thank all of those who chose to stay here with us over the past week!!! After a busy week here at the marina, with all the tournament frenzy, it was a quiet Sunday. 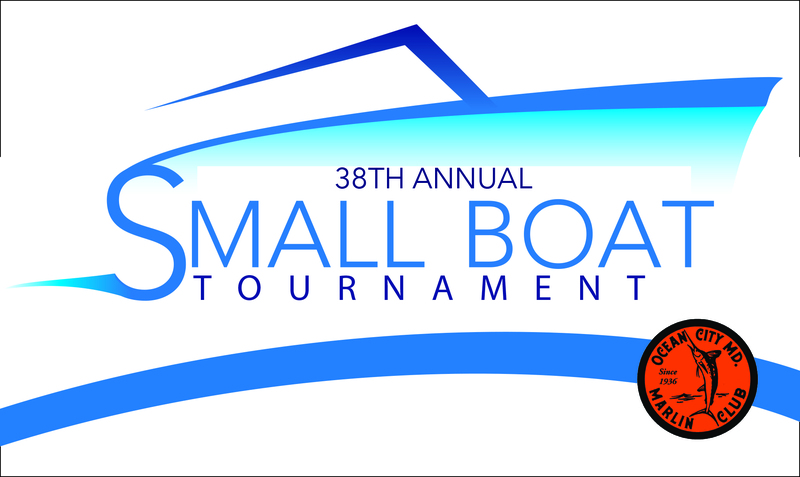 Many of the tournament boats have departed in the past two days and we have returned to more of the normal routine around the marina. We only had a few boats venture out today but those who did were not disappointed. The ‘C-Boys’ crew fished in the Baltimore Canyon today and returned with 20 dolphin and they also released a white marlin. The crew of the ‘Reel Chaos’ fished in the Wilmington Canyon today and released 2 white marlin. The ‘Let it Ride’ returned later in the evening fishing just outside of the Wilmington Canyon and had 7 white releases. Next up is the 25th Annual Steve Harman’s Poor Girls Open. Have you booked your trip yet? Anglers, Are You #WMO Ready? Rigging and icing baits, thousands of gallons of fuel, and spooling reels are just a few of the sights that you would see down any of the docks today as almost all of our boats prepare to fish the White Marlin Open. The action begins first thing tomorrow morning, with some boats leaving as early as 4:00am. We checked in with our friends over at the White Marlin Open, who were happy to report 382 boats registered for this year’s tournament and a record payout of $5.45 Million to distribute among the winners. If you’re schedule is free tomorrow morning, we recommend making the trip to the Ocean City Inlet to watch the boats leave the bay- it’s truly a sight to see and a photo-perfect moment! And if you’re not a morning person, come on by Sunset Grille, grab a cold drink, and watch the boats roll in to prepare for the upcoming days. As always, stay with us for the latest updates from what’s happening right here, and tune in to the White Marlin Open Live Feed to watch the weigh-in’s live from your phone or computer. The docks were extremely busy today as more of our tournament boats continue to trickle in just in time for next week’s 45th annual White Marlin Open. Our crews spent the day fueling up, rigging baits, and doing routine maintenance like changing oil to make sure they are tournament ready. Due to the weather offshore today unfortunately we only had one boat go out to see what they could find. The crew of the ‘Marli’ fished in the Massey’s Canyon and returned with 2 dolphin and 3 bluefin tuna. This is the perfect time of year to swing by the marina, grab yourself a drink at the bar, and see all of the beautiful boats that are docked here at Sunset Marina!! Today we rung in the last day of July watching the fleet prepare for the busy week again. Preparing lures, boat maintenance, and fueling up is all the crew’s are focused on to get ready for the chaos of next week. A few boats fished today, certainly to try and find the fish and get a head start on the action. The ‘Boss Hogg’, who was back by 1:00, returned with 4 Bluefin and 1 Dolphin from the Masseys. The ‘Osprey’ returned shortly after from their trip to the Hambone with 2 Bluefin. Also in the Hambone was Kyle Peet on the ‘No Quarter’, catching 3 Bluefin. The ‘Marli’ ventured to the Washington Canyons, bringing back 4 Bluefin and releasing a white marlin. Stay tuned with us throughout the week for the latest, and for where, quite possibly, these fishermen can find whitey. White Marlin Open, Here We Come. After a slow week of fishing, the fleet ventured out for the ‘Biggest Fish’ for the Big Fish Classic, pun intended. The tournament, hosted at Talbot St. Pier, boasted a new record payout of over $462,000 to be given out to a few lucky anglers. 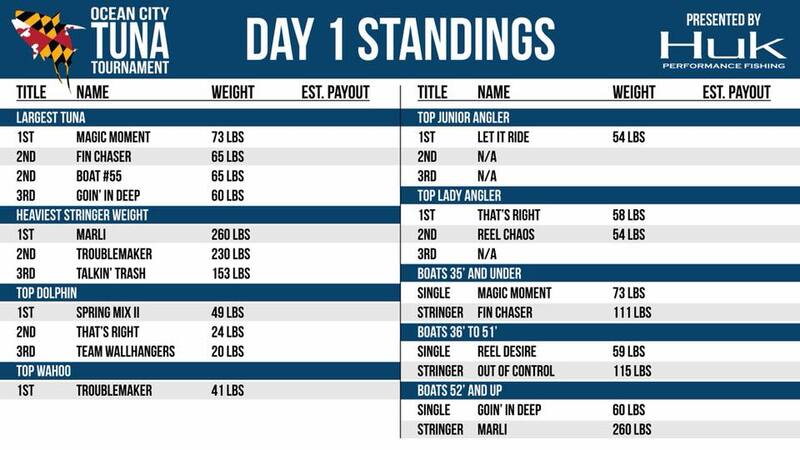 We are happy to announce that one of our own took most of the pie, with the ‘Reel Tight’ from A-dock winning over $244,000 for their 404.5 lb Blue Marlin. Other winners from Sunset include the Primary Search, who weighed in a swordfish, and the Absolute Pleasure with White Marlin releases, among others. We certainly saw a chance of pace on the docks, with it feeling more like tournament season with every passing day. New boats are arriving daily, making Sunset Marina their home for the next couple weeks as they prepare to fish the White Marlin Open, Mid-Atlantic, and the other tournaments that fall in-between. If you’re curious how the tournament turned out, check out the leaderboard below! Its been a slow week at the docks with rough seas offshore forcing the fleet to remain at the docks. The weather finally cleared enough to fish today, with quite a few boats going out both to fun-fish and for the Big Fish Classic tournament. The ‘Marli’ fished the Poor Mans. returning with 3 Yellowfin and 1 Dolphin. Also in the Poor Mans was the Zipper, returning with 10 Dolphin. 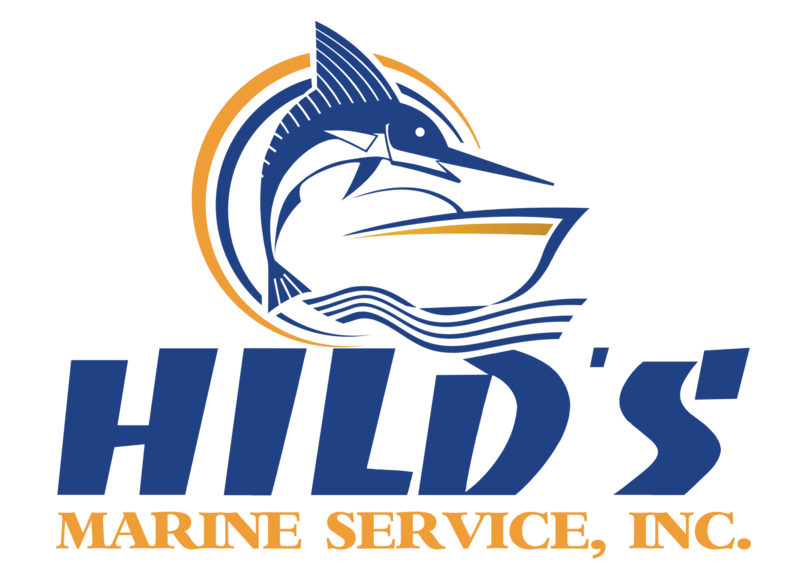 The ‘C-Boys’ caught a whopping 37 Dolphin and 1 Yellowfin, while also releasing a White Marlin. Capt. Luke reported to be fishing in the Washington. There’s plenty of action on the docks this evening, signalling for a big day of fishing for tomorrow. IF you’re interested in watching the weigh-in’s for the Big Fish Classic over this weekend, check out the live feed at https://www.bigfishclassic.com/. Weigh ins will be streamed from 4pm to 9pm on Friday & Saturday, with the last and final day running from 4pm to 9pm. Good luck anglers! Rough seas are expected both inshore and offshore for the weekend ahead, causing the Kids Classic to be cancelled and keeping the fleet at the dock for the weekend. Most of the fleet went offshore today to squeeze a fishing day in before the storms roll in. The ‘Rhondas Osprey’ fished the Hambone, returning with 3 Yellowfin Tunas. The ‘Baltimore’ was the go-to for the ‘Griffin ( 8Dolphin and 1 White Release), and the ‘Boss Hogg’ (12 Dolphin) The ‘Marli’ fished the Hot Dog, returning with 2 Yellowfin, 1 Dolphin, and a bluefin weighing in at 120lbs. The ‘Reel Chaos’ crew trekked to the Poor Mans, bringing their crew back with a whopping 20 Dolphin and 2 White releases. We saw more Bluefin today, which would have shaken the scales up a bit had it happens just a few days prior. We are also seeing an increase in the Marlin bite, which brings great news for the upcoming Big Fish Classic and White Marlin Open. As we mentioned earlier, we don’t expect much action to be heard from the docks over the weekend due to weather. Fishing was rather slow today for our charter boats with most of them venturing out to the Poorman’s Canyon. Catching 2 dolphin, 15 sea bass, and 10 tile fish was the “Boss Hogg”. The “Pumpin Hard” was our only boat to release a white marlin, as well as catching 7 dolphin. Lastly, the “Marli” caught 2 dolphin. Venturing alone to the Massey’s Canyon was the “No Quarter” catching 2 nice bluefin. It looks like the fleet will all be leaving the docks and fishing tomorrow, so make sure to check back with us for the latest fishing report right here from Sunset Marina!!! While most of the fleet is still resting up after a busy weekend with the Ocean City Tuna Tournament, a few boats ventured offshore to find the fish in preparation of the upcoming tournaments. The ‘Marli’ went to the Hambone and brought home 8 Yellowfin and 1 Dolphin for their charter. In the Washington was the ‘Fish On’, returning with a whopping 14 Dolphin for his crew. We don’t expect much action tomorrow despite fishable weather offshore, most likely so the fleet can go full-force on the weekend fishing. If this changes, you can find out right here tomorrow evening for the latest report. Ask anyone on the docks, the 2018 Ocean City Tuna Tournament was a nail-biting experience for most with plenty of action at the scales. We saw huge numbers of tuna, massive dolphin, and even a wahoo. The weather changed for the worst as the weekend progressed, but this didn’t stop our fleet to head out and earn the prize money. A special shoutout to a few boats in the Sunset Marina family who won some money from the Tuna Tournament: the Marli, who claimed second place in the Stringer category, took home over $83,000. They fell just shy of the ‘Goin In Deep’, who took first place in that category winning over $237,000 for their 325lb stringer weight. The ‘Magic Moment’ held first place in the tuna category on Day 1 but in the end fell into second place with his 73lb Yellowfin and taking home over $45,000. The ‘No Quarter’ had quite the payout as well, winning over $46,000 for their third place stringer. 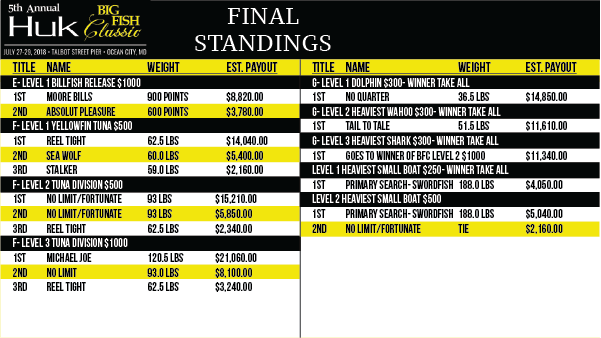 The ‘Reel Chaos’ placed 3rd in the heaviest Dolphin category and second in the Lady Angler category, winning $1,500 overall. 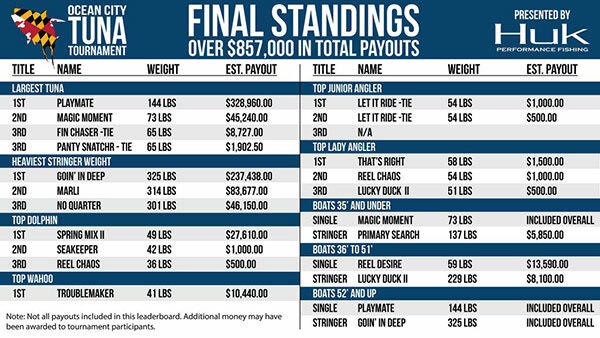 ‘Lucky Duck II’ placed in two category’s as well, taking third in Top Lady Angler and heaviest stringer for boats 36′ to 51′, taking home $8,600 in winnings. ‘Let It Ride’, docked on C-dock, took home first and second place in the Junior angler category with two 54lb Tuna. Yes, he tied himself! The ‘Primary Search’ took home $5,850 for holding the heaviest stringer weight for boats 35′ and under with their 137lb Stringer. Check out the full leader-board below!